Chicago was responsible for nearly half of 2016’s increase in homicides in the US, though the nation’s crime rates remain near historic lows. 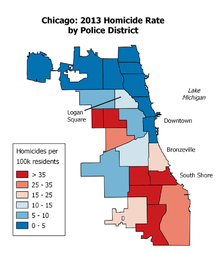 The reasons for the higher numbers in Chicago remain unclear. Is this some kind of progressive joke? We know the reason and so does everyone else. Even Rahm knows the reason. Chicago saw a major rise in violent crime starting in the late 1960s. Murders in the city first peaked in 1974, with 970 murders when the city’s population was over three million, resulting in a murder rate of around 29 per 100,000, and again in 1992, with 943 murders when the city had fewer than three million people, resulting in a murder rate of 34 murders per 100,000 citizens. Chicago, once know as the Butcher to the World, without exception knows how to hang the beef; carcasses everywhere, South side, West side, East side, West side and all around the town. They do things different in Chicago! Not the homicide rate under each mayor’s term, those Daley’s take the cake. And we know how much they loved Black people. Culling the herd by letting criminals execute their own was a way for street justice to prevail. We also take the opportunity to mention that all of these mayors were of the Democrat variety. Did you expect anything different? Chicago Mayor Rahm Emanuel blamed the city’s massive crime problem on a “shortage of values” after at least 75 people were shot over the weekend. According to the politically correct pols, Rahm’s statement was heresy. “You never want a (click here for Tucker)serious crisis go to waste.” BTW, Rahm has pulled from this years mayoral race. Chicago’s eponymous South and West Side have suffered another Christmas blood bath of gargantuan proportions. Sixty wounded and eleven dead during the holiday. Although the year is not dead yet, expect the number of murders to clock in at over 800. Well armed gangs roam the streets packing heat, exercising dominion over the hood. Rivals test their mettle. Innocents become victims of stray bullets often times they are no older than five. A better name for the South and West Sides are Butchers Alleys. Remember, Chicago was once known as the “Hog Butcher of the World.” Not many Hogs in the body count, but plenty of Beef. This doesn’t seem to bother the officials. To them, a dead Black is only a meaningless statistic. Why else would they stand by and do nothing? “Hog butcher to the world – And they tell me you are crooked and I answer: Yes, it is true I have seen the gunman kill and go free to kill again.” Carl Sandberg had it right, Chicago is a town of killers. These aren’t the mafia types of lore, but the murderous thugs born of liberal profligacy where families don’t exist. The gang is the father and mother, they provide the love to the sworn killer whose thirst for blood has no end. Revenge is the fodder that feeds the blood lust. But don’t despair, the political crack heads yearn for more. Why else do they continue to condone gang violence? Over Sixty shot, eleven killed. New records set by the hour. A total of 61 people were shot in the city during the holiday weekend and 11 of them died of their wounds, according to data kept by the Tribune. Seven people were killed on Christmas Day alone, more than on the holiday the past three years combined. Three people were killed in 2015, one in 2014, and two in 2013. Chicago police Superintendent Eddie Johnson said most of the weekend’s victims were targeted by gang members. Since the Hillary campaign implosion has grown legs, the email server a life of its own, most news WORTHY ITEMS have been relegated to the back pages. Little noticed was the blood flowing in Chicago streets. Liberal news organizations, better known as the lame stream media, has failed to report the news, but consistently tailor it to their own political philosophy such as Chicago, a city taken over by gangs. The violence and murders continue at a dynamic rate well on its way of surpassing all previous records. Who cares about the gang banger killings, the saying goes, this is Black on Black, no racist agenda here. FROM THE CHICAGO TRIBUNE. As summer draws to an unofficial close on Labor Day, the rise in violence plaguing Chicago this year has even spread to unlikely communities such as Albany Park, a laid-back, diverse working-class neighborhood made up of handsome brick bungalows and two-flats. Through Sept. 3, homicides have jumped to nine in the Albany Park police district, up from just two in the year-earlier period, according to data from the Police Department. Shooting incidents have more than doubled to 23 from nine in the district, which includes the Irving Park and Ravenswood Manor neighborhoods on the city’s Northwest Side.